The legislature’s Executive and Legislative Nominations Committee voted Thursday to recommend that the full General Assembly confirm former Sen. Rob Kane of Watertown as the Republican auditor of public accounts, a legislative patronage post that oversees a staff of more than 100 professional auditors. Kane’s confirmation came as The Hartford Courant reported Kane had fallen behind on obligations related to a divorce settlement. 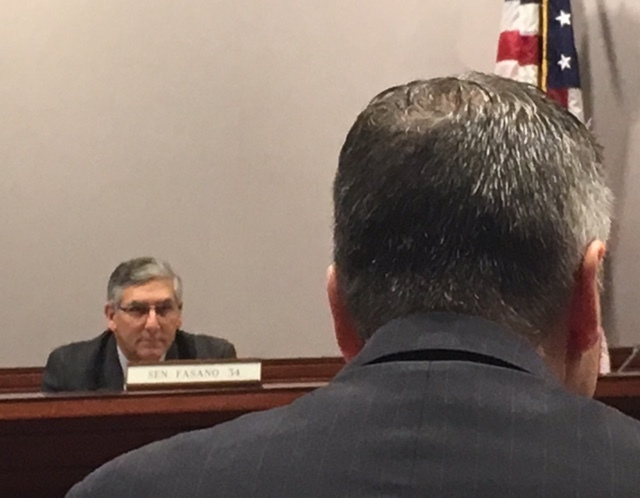 But the committee is not known for blocking nominees, especially recent colleagues chosen for their pending job by the co-chair of the panel, the Senate Republican leader, Len Fasano of North Haven. His selection already carried with it a measure of bipartisan blessing: It was possible only through the choreographed resignations of a Republican and a Democrat to maintain the balance of power in the evenly divided Senate. Eric Coleman, a Democrat of Bloomfield, resigned to pursue a judicial appointment. No one on the committee posed a question about the political machinations that brought Kane before them. Fasano posed a series of questions about Kane’s debt and and his repeated failure to make a $20 annual filing with the secretary of the state’s office regarding his small business, RJK Mobile Communications. Kane called those failings embarrassing, but not disqualifying. Sen. Len Fasano facing Rob Kane. Kane, a divorced father of two, failed to pay $4,862 in tuition and other expenses he was to share equally with his ex-wife under their divorce settlement. He receives alimony from his wife, a psychologist. Rep. Terrie E. Wood, R-Darien, sharply questioned Kane on his qualifications to oversee the large auditors’ staff, given his lack of management experience. The previous appointees were House Republican leaders, Robert Ward and Robert Jaekle. Ward also had been the commissioner of motor vehicles. In brief remarks before the unanimous vote, Wood questioned whether the job should be a “plum job” for political insiders. “I’m not sure it should be a political appointment. I think it should be more competitive,” Wood said. “We have one nominee before us,” he said. Connecticut has a Democratic and Republican auditor of public accounts, who jointly oversee a legislative agency that is a check and balance on the executive and legislative branches. But other than the bipartisan rule regarding the two auditors, the statutes are relatively silent on any minimum qualifications the auditors must possess. Kane would succeed Ward, who was appointed in 2010 at the same time as the Democratic auditor, former Rep. John C. Geragosian. Ward retired last month. Connecticut’s auditors have come from a wide variety of backgrounds. Robert Claffey, who served from 1959 to 1965, owned a store. Raymond Thatcher, who served from 1956 to 1958, was a pharmacist, while Leo Donohue, auditor from 1967 to 1992, was a career state employee.